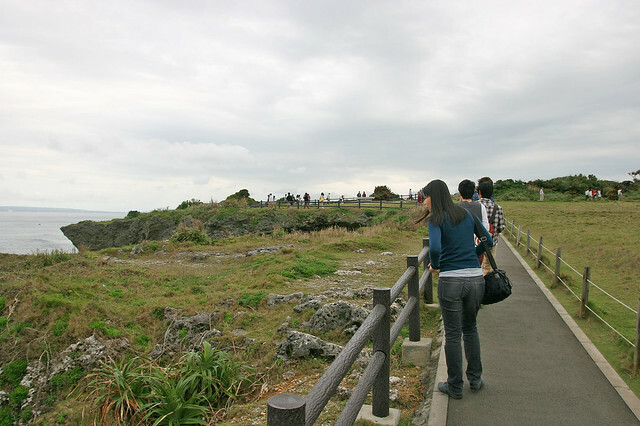 The grand Cape Manzamo is one of the top tourist scenic spots in Okinawa. 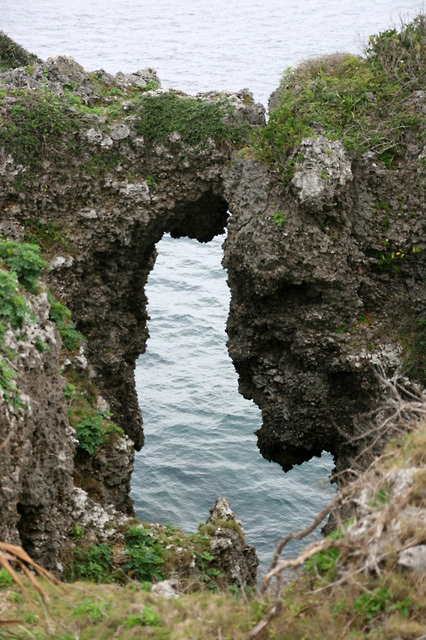 It faces the East China Sea and is famous for the elephant shaped rock formation, with the trunk or nose ("zoe no hanna") dipping into the ocean. See? It totally looks like one, although the rock would probably disagree, "Who're you calling an elephant?!" The weather was still a little chilly when we were there (early March). I have seen in pictures how the waters are gorgeous shades of turquoise during summer. With this significant icon, you'd assume Manzamo means Great Elephant Rock or some sort, but no. In the local dialect, Manzamo (万座毛) means "ten thousand men sitting on the grassland" - because Ryukyu King Sho Kei who visited in the 18th Century was so impressed with the wide plateau that he dubbed this place Man 万(10,000) Za 座(to sit) Mo 毛(field/grassland) as an indication of its size. That would be one huge picnic. No mention of the elephant shaped rock by the King. Was it visible back then? Maybe the limestone didn't look like one yet, or maybe the king had not seen many elephants before. I can't help but think that someday the limestone will erode and the elephant will morph into something else. Catch it before it does! Still, besides the elephant limestone outcrop, there are other rocks equally worthy of your imaginative contemplation. There's even some good diving to be had here, at the funnily named Toilet Bowl. No, not this one above. 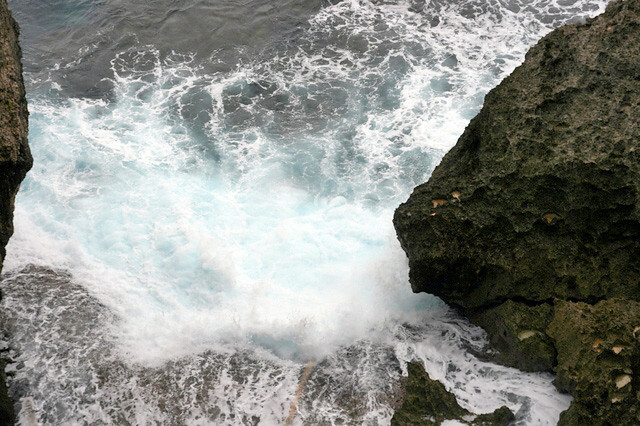 There are tide pools with lots of interesting marine life to see, but beware the jagged rocks. There is also a pair of little known twin Jizo statues, (read more at the link). 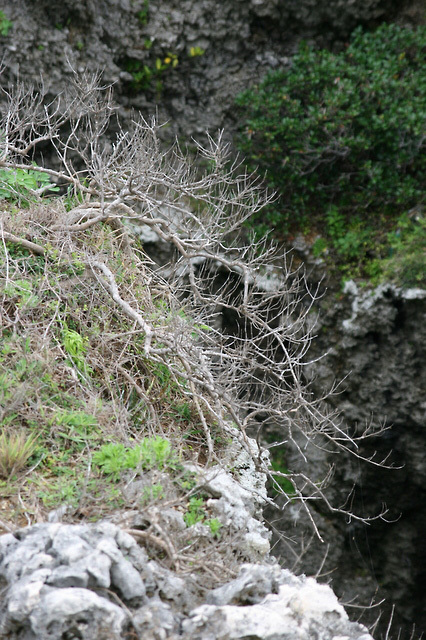 Plant life here can be a little different as it has to withstand harsh coastal weather. The whole area reminds me of the Great Ocean Road near Melbourne. 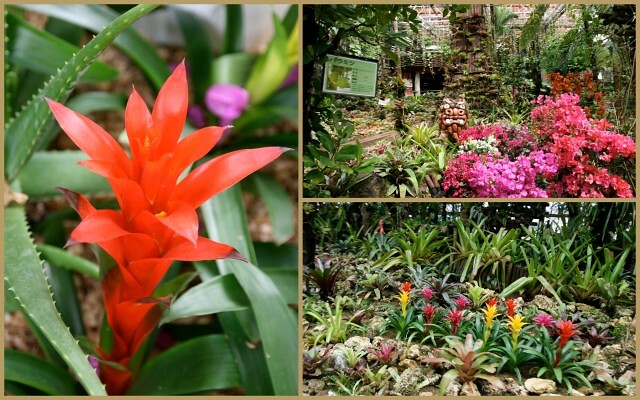 It's a pretty place to see, but if you're on a bus tour, you're likely to be hurried off to your next destination without the opportunity to really explore the area. 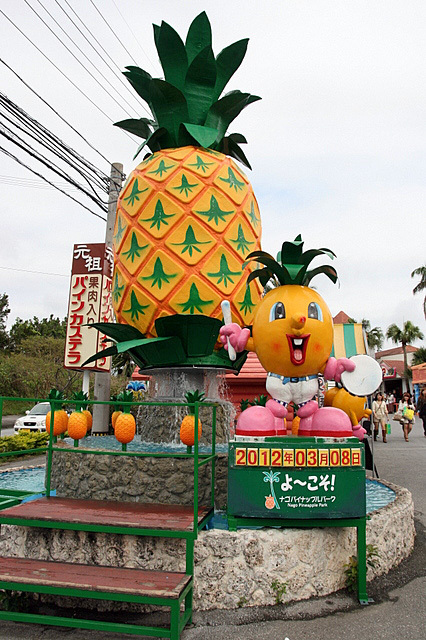 So off we went, past the souvenir stalls in the parking lot, to our next stop - Nago Pineapple Park. 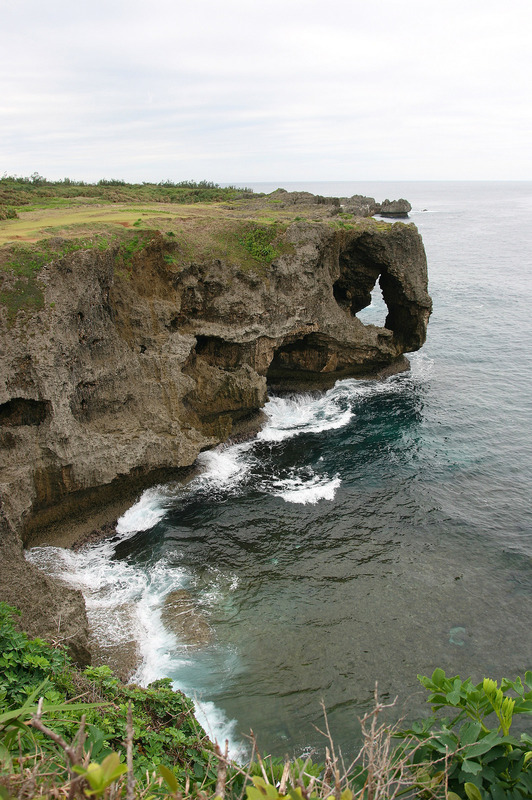 The main Okinawa island is divided into southern, central and northern zones. 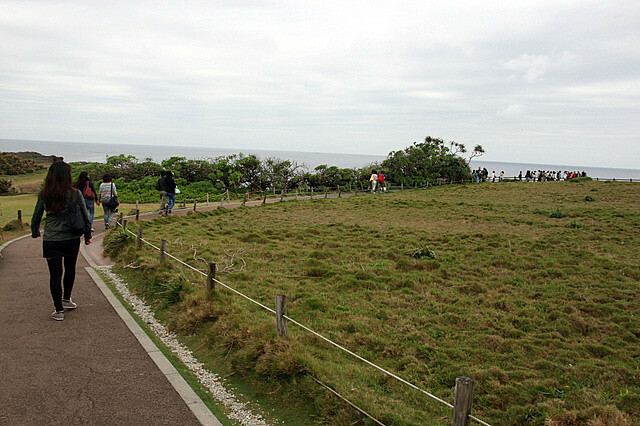 Manzamo is in the centre near the town of Onna, and the pineapple park is at Nago just slightly north of it. The southern part, where Naha is, remains the most heavily populated. We covered a lot of ground on the first day of our media trip (organised by CTC Travel, Okinawa Visitors and Convention Bureau, and Okinawa Tourist Service). 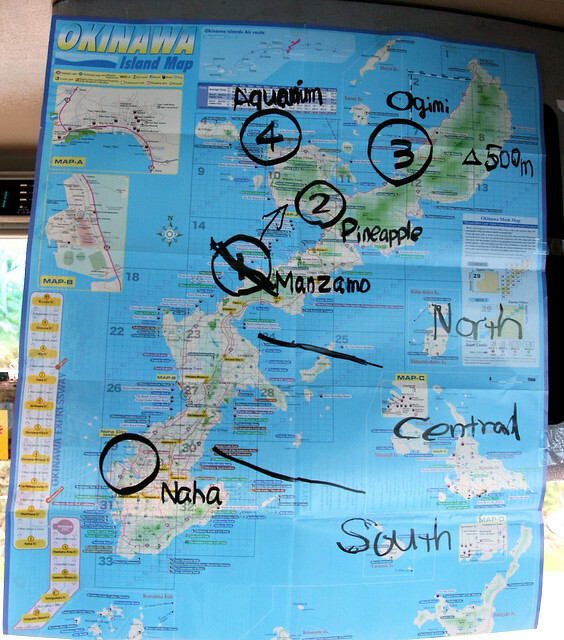 The places shown on the map - Manzamo, Nago, Ogimi Village, Churaumi Aquarium - are all more than an hour's drive up north. OK, here's the Pineapple Park. Well, Singapore's right next to a huge pineapple producer (Johor), so you might wonder if there's anything interesting to glean here. 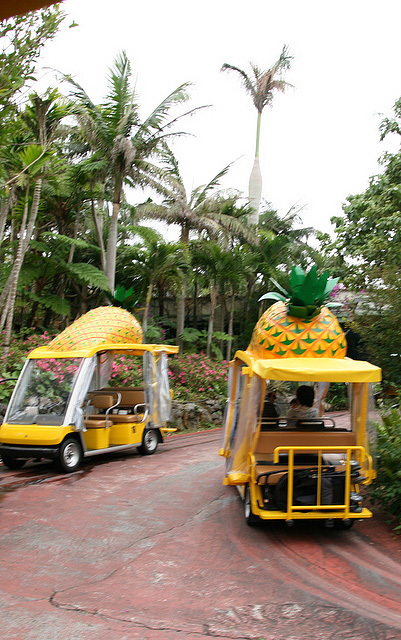 The theme park is really small - the first part is a driverless buggy ride that brings you on a (very brief) trail to see pineapple plants and related flora. Our tour included commentary in English. 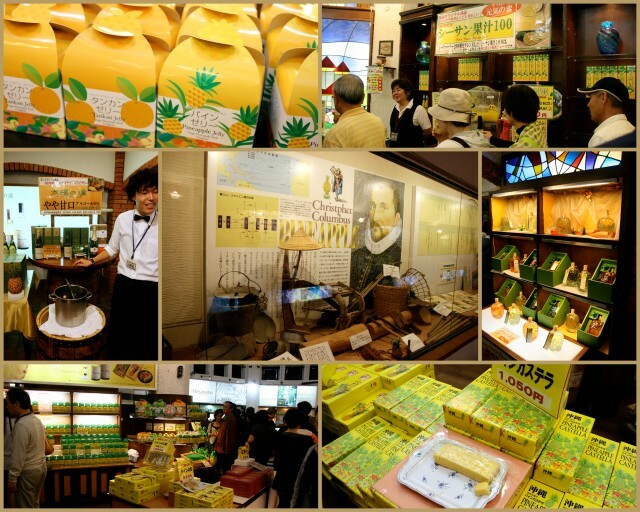 It then deposits you to an even longer trail - pineapple products of all kinds! And free sampling of everything! 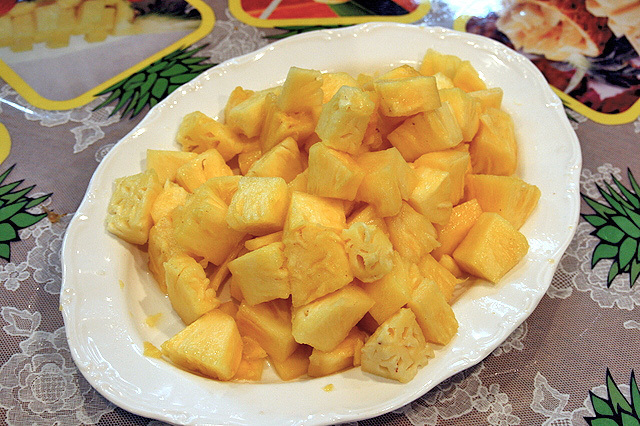 Pineapple wine, pineapple jelly, pineapple kasutera (a type of sponge cake), pineapple cookies, pineapple candy, pineapple. Other fruits also get a chance to star - shikuwasa (the local calamansi). If you're interested in the kasutera, wait til you get closer to the end where the Gold Award winner is. The Bronze and Silver ones you'll encounter first, and there are cashiers all along the way, but hold those impulses. 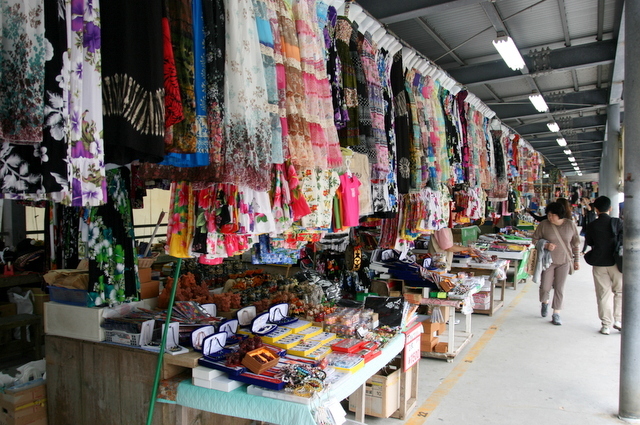 There are even beauty products like soap, pineapple charcoal, etc. The actual pineapple is exceptionally juicy. I don't know how they manage to pack in that much water into the fruit! 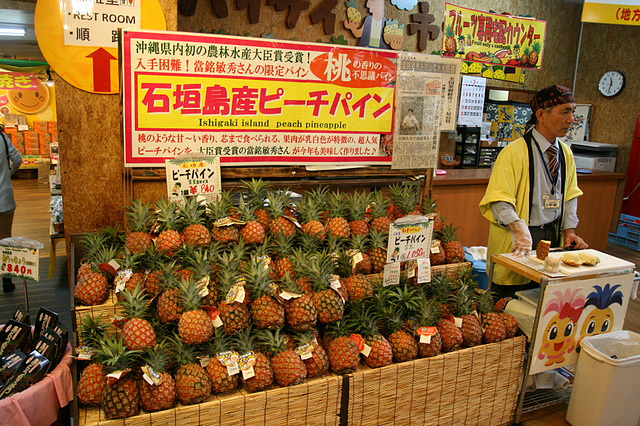 You can even try unusual species like peach pineapple, like these from Ishigaki Island. It really does taste faintly of peach, and is not as tangy as regular pineapple. 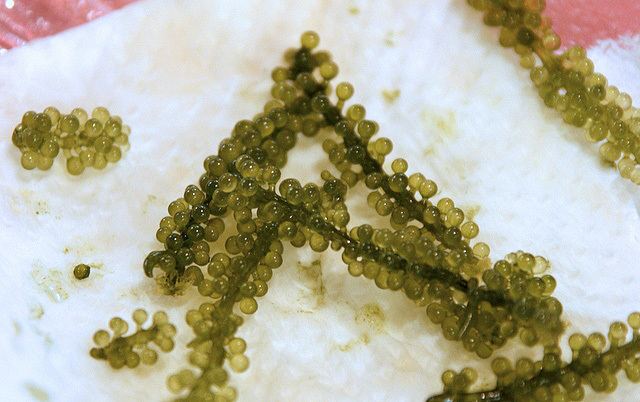 I also got to try umibudou or sea grapes, a kind of seaweed. By themselves, they have a cool popping texture, but not much flavour. Dip them in ponzu, however, and it's an explosion of flavour. These are also available outside the pineapple park, of course. It's hard to make it through the trail without buying something. At the very end there are souvenirs, and at the exit/entrance - ice cream cones, with pineapple as a flavour choice, of course. 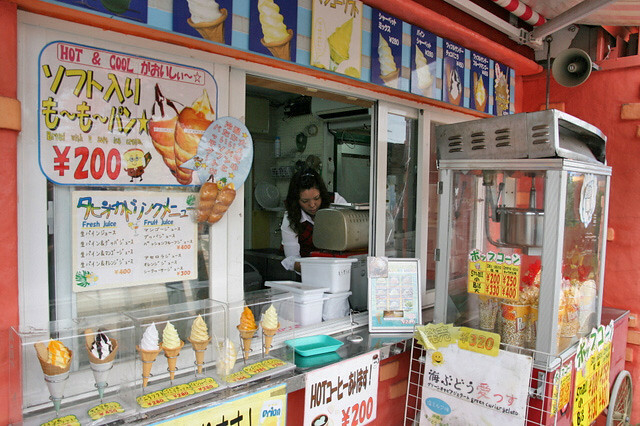 Ice cream, we came to realise during our stay, is a big thing in Okinawa. Park entry fees are 600 yen for adults, 300 yen for children aged 7-12, with a 10 per cent discount for groups. Next up - Emi no Mise for a traditional and naturally organic Okinawan lunch, and the world's second largest aquarium tank at Churaumi Aquarium! I love pineapple. here is a huge variety of things made with pineapple. love to try when I visit there. Okinawa is really a nice place. I remember when I first went to Japan where I bought my first ever dslr camera. I was able to test its amazing performance in Okinawa's great places.